Seo an Samhradh – séasúr na n-athchraoltaí – mar sin ní ghabhfaidh mé leithscéal as é seo a roinnt libh arís. Nó bhí sé ar na buaicphointí ag an OIreachtas anuraidh i gCorcaigh. Os rud é gur luaigh mé thíos é agus mé ag caint ar Des Bishop, seo chughaibh Bubba Shakespeare ag ‘rappáíl’ as Gaeilge. Rinné mé é a scannánú agus mé ag amharc ar Sheó Ronáin á chraoladh ar Raidió na Gaeltachta, beo ó lobaí an Rochestown Park Hotel i gCorcaigh. Má tá aoinne eile amuigh ansin le saothar nua i nGaeilge agus fonn orthu nasc le h-aghaidh físeán a chur chugam, beidh fáilte roimis. Ná bíodh sé ró ghairsiúil. Suíomh don teaghlach é iGaeilge! Foilsiú: 24/06/2009 . igaeilge a d’fhoilsigh. Ranganna: An Ghaeilge. Clibeanna: Bubba Shakespeare, Des Bishop. Is tú an fear, a Des! Táim buioch don seirbhis uathoibreach tweetáil Giolchairithe as ucht an nasc seo a chur ar fáil. Píosa spóírt – Des Bishop ag léimpt thart i nGaeilge, san Astráil. Foilsiú: 24/06/2009 . igaeilge a d’fhoilsigh. Ranganna: An Ghaeilge, Cultúr. Clibeanna: Des Bishop, Giolchairithe. Tá moladh tugtha agam do Des Bishop roimhe seo ar an suíomh – agus tá sé tuillte aige chomh fada is a bhaineann sé liom cé go n-aithním go bhfuil daoine ann nach bhfuil a gcroithe tugtha acu go h-iomlán don bPoncánach Gaelach – nó an é sin an Ghael Poncánach? Ar aon nós ní miste liom go bhfuair Des an saor phoiblíocht seo – cá bhfios b’fheidir gur fuair sé táille as. Fair Play do, mar a deir siad i gConamara! Rud amháin a chuireann as dom, caithfidh mé a admháil, an droch chaint a bhí ag Des – agus ag fir grinn i gcoitinne – agus iad ar chláracha ar nós an Late Late Show. An é go bhfaigheann siad airgead breise as gach ‘focal’ sa bhreis a bhaineann siad úsáid as? Roinnt seachtainí ó shin bhí Tommy Tiernan ar an show agus ba dheacair a dhéanamh amach cén teanga a bhí á labhairt aige ach is cinnte go raibh sé lán le na focail brocacha seo. D’ardaíodh gleó mar gheall air sna meáin chlóite – nach bhfaca mé an focal s**t i gceannlíne ar an Sunday Independent le déanaí – agus rinne Udarás RTÉ gearán i dtaobh an oiread san droch chaint bheith ar an gclár agus tugadh rabhadh in éadan a thuilleadh dá leitheid, go h-áirithe ar chláracha ar nós an Late Late Show fiú go bhfuil siad á chraoladh tar éis am luí na bpáistí. Ní ar mhaithe leis na bpáistí atáim ag cur na ceiste anseo faoin oiread droch chaint a bhionn ar chláracha ar nós an Late Late Show go h-áirithe nuair a bhionn fir nó mná grinn ann mar aoíanna. Ní thaithníonn droch chaint liom féin. Sin an méid. Cinnte gur úsáideas droch fhocail mé féin – ach ní raibh siad nó ní bhíonn siad agus tá súil agam nach mbeidh siad im chaint chomh flúirseach is gur cumóga a bhí ann. 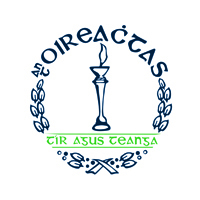 Ritheann sé liom go bhfuil abhar rúin le h-aghaidh comórtas dreas cainte ag Oireachtas na bliana seo chugainn sa mhéid atá á rá agam – Is túisce droch chaint ná Gaeilge ar RTÉ! Ar aon nós, bhí sé go deas an Ghaeilge a chloisteáil ar an Late Late Show cinnte, fiú go raibh cúpla ‘focal’ measctha isteach sa dhioschúrsa ná raibh chomh taithneamhach san. Glacaim leis go n-aithníonn leitheoirí iGaeilge go mbionn ana chuid leabhair, DVDanna is eile le díol ag aoíanna an Late Late Show – agus a leathbhadóir, Tubridy Tonight – agus ritheann sé liom gur mór an trua nach mbionn deis riamh ag údar Gaelach a leabhar nó a dhluthdhiosca físe a dhíol ar na seóanna seo, nó a gcomhionann ar an raidió. Ar eigean, mar shampla, go bhfeicfear Dé hAoine seo chugainn, 28 Samhain, nuair a bheidh an Seó Bréagáin ar siúl ar an Late Late Show, leabhar Ghaeilge ar bith ann. Agus is cinnte, in ainneoin a laghad is a dhíoltar leabhair Ghaeilge, go bhfuil caighdeán leabhair do pháistí ag feabhsú leis. Ní gá ach leabhair ar nós buaiteoir Ghradam Reics Carló, An Phleist Mhór ó Mhóinín, a thabhairt faoi ndeara chun seo a aithint. Is cinnte go bhfuil leabhair Ghaeilge dá leithéid á dhíol faoina luach ag an dream ar cheart a bheith a chur os comhair an phobail, Foras na Gaeilge et al. Ach ní racht é seo i gcoinne Foras na Gaeilge. Cad is fiú bheith ag caint leo? In ainneoin an mhéid atá ráite agam faoin dhroch chaint a bhionn aige agus é ar an ardán, bíodh sé ag an Late Late Show nó eile, tá níos mó déanta ag Des Bishop ar son na teanga ná mar a dhéanfaidh Foras na Gaeilge choiche leis an gcur chuige leibideach leithscéalach leathchosach atá ag an institiúid teanga tras teorainn. Guím gach rath ar an DVD nua agus ar a leathbhadóir, Tongues, atá ar díol freisin faoi láthair. Go luath, beidh mé ag nochtadh plean ar an suíomh seo a thabharfaidh ardán níos fearr do leabhair, DVDanna is eile i nGaeilge, ardán ar a dheinfear leirmheas neamhspleach ar na saothair chun leid a thabhairt do Ghaeil cad iad a mbuanna. Bígí ag léamh…..
Foilsiú: 19/11/2008 . igaeilge a d’fhoilsigh. Ranganna: An Ghaeilge, Cultúr. Clibeanna: Des Bishop, Late Late Show, RTÉ. Comhghairdeas leat a Ghaeil ghroí! 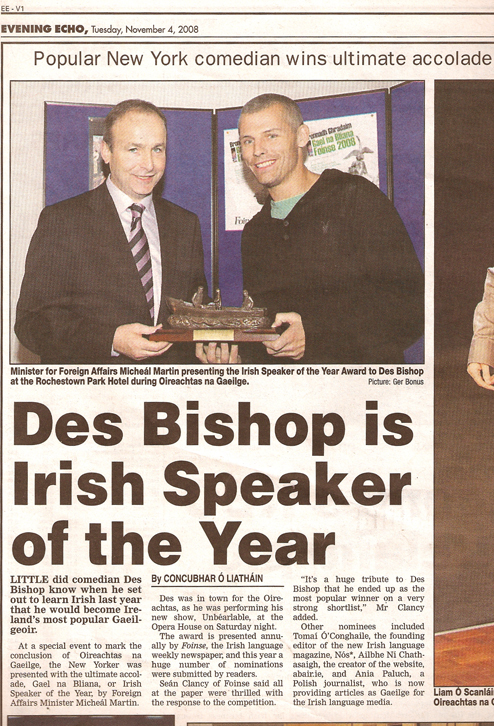 Des Bishop, Gael na bliana. Comhghairdeas leat. Ní thagaim leis an tuairimíocht atá ag Joe Steve O Neachtain, dá mhéid mo mheas agam ar Joe, a deir nach ar leas an OIreachtais nó na Gaeilge do leitheid, daoine mór clú, bheith ag baint leo. Creidim gur teanga í an Ghaeilge atá ar fáil do gach duine agus ní chuireann sé as dom má bhionn daoine ag iarraidh í a fhoghlaim de bharr go bhfuil sé ‘gnéasach’ anois. Ní doigh liom gurb é sin atá ar chúl suim Des Bishop. Creidim go bhfuil Des gafa leis an Ghaeilge don fhad treimhse. Tá paisean aige don teanga agus tuigeann sé í agus an polataíocht a bhaineann lei. Ach fiú dá mbeadh sé ann de bharr í bheith ‘gnéasach’ faoi láthair, nach cuma. Bhí sé súntasach, chomh maith, go raibh rún ar chlár na n-ábhar don dreas cainte ag an Oireachtas ag tabhairt le fios ‘go raibh an t-aos óg ró líonmhar ag an Oireachtas. B’fheidir go bhfuil aicme áirithe ag an Oireachtas agus i measc saol na Gaeilge a chreideann go daingean gur cheart gach rud gaelach a bheith ann ar an ‘sean nós’ amháin agus don sean aos amháin. B’fheidir gurb é Ré na Gaeilge Gnéasaí cothrom na linne seo de Ré an Tiogair Cheiltigh atá díreach cáite. Is cinnte go bhfuil an Ghaeilge ag teacht in uachtar arís, in ainneoin iarrachtaí Fhoras na Gaeilge agus an Roinn Oideachais í a chur faoi chois tre nuachtáin a dhúnadh agus tumoideachas Ghaeilge a shéanadh ar naíonáin. An ceacht atá le foghlaim ón méid a tharla le linn ré an Tiogair Cheiltigh go gcaithfimíd togáíl go stuam ar an dea mhéin atá ann don teanga i measc an phobail, dea mhéin den chineál a léirigh an Evening Echo. Conas teacht i dtír ar sin chun todhchaí faoi bhlath san fhad treimhse a dhearbhú don Ghaeilge, sín í ár ndúshlán? Aon tuairimí agaibh a chairde! Foilsiú: 06/11/2008 . igaeilge a d’fhoilsigh. Ranganna: An Ghaeilge, Cúrsaí Reatha, Cultúr, Nuacht. Clibeanna: An tOireachtas, Des Bishop, Foinse, Gaeilge, Gael na Bliana, Joe Steve Ó Neachtain.